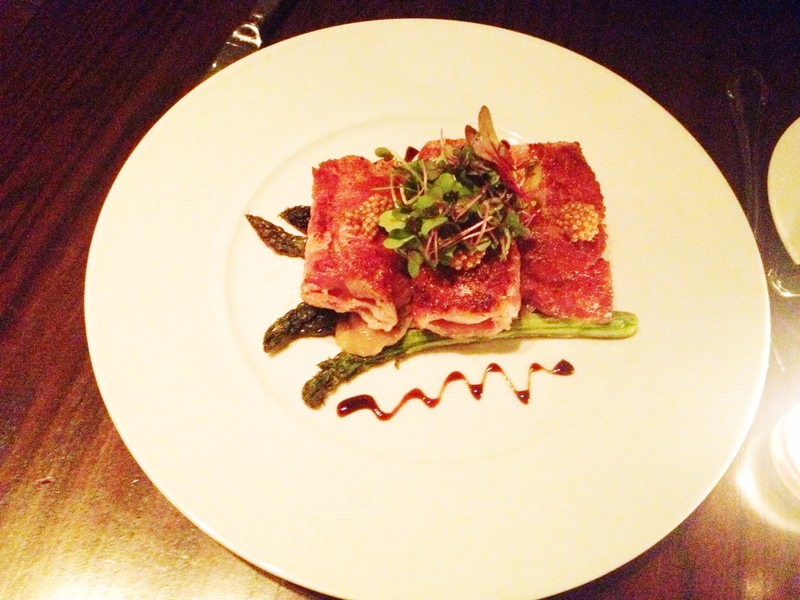 Gramercy Park in Manhattan is a delightfully gastronomic neighbourhood. There are a number of great restaurants to choose from and tonight we had a booking at Veritas wine bar. Dimly lit, bottles line the wall on the horizontal, a subdued mood is emphasised with a light wood hue and flickering candlelight. Veritas has all the markings of an upmarket restaurant, from the outstanding service to understated yet refined styling. It’s the kind of place where flesh is pressed and deals are brokered, all at a very decent price. 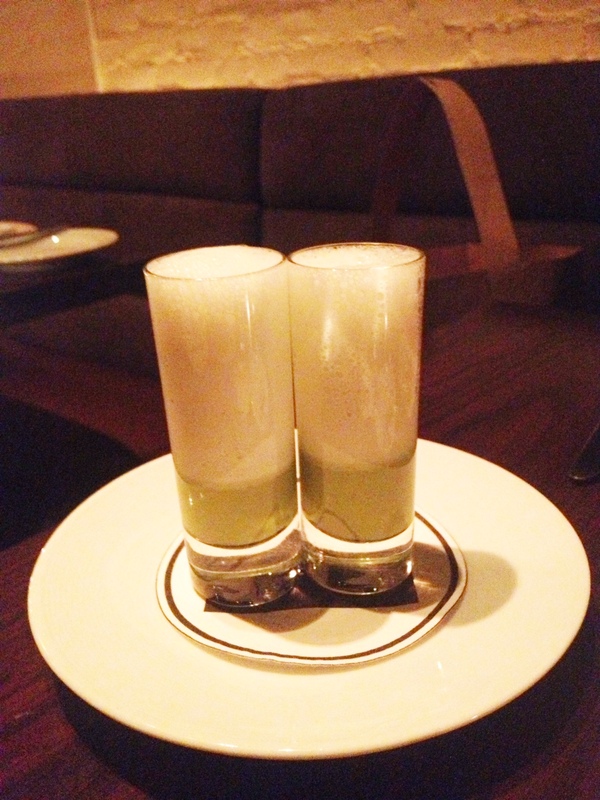 Ordering a la carte, we were surprised (and delighted) when two shot glasses were placed unexpectedly infront of us. We started with the equivalent of fine dining stretching of our palates – with an amuse-bouche of chilled creamy spring mint & pea soup. 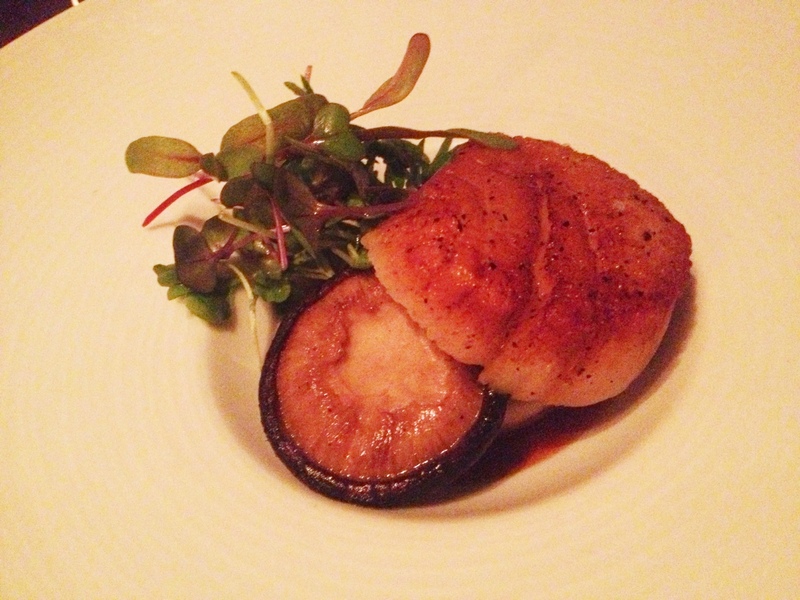 To start, I ordered two fresh sweet and plump diver scallops enveloped a foie gras filling. A sophisticated pairing and well balanced. The genius of this dish was in its simplicity, allowing the two meats equal billing, without the pomp and ceremony of too many accessories. To follow, I couldn’t go past the Maple-brined woolly pig. The mere suggestion of the name had won me over. Served with cherry tomatoes and wilted butter lettuce ($39). 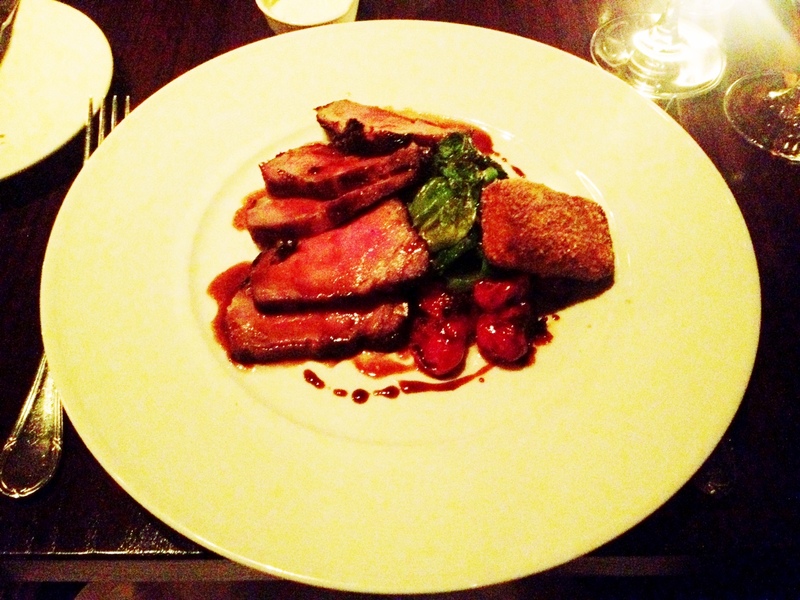 The pork loin was well marbled and actually looked a little like duck, with its rich dark-pink flesh. It was everything pork should be, delicious, sweet, tender and not at all piggy. Accompanied with a pork floss croquette, an essential partner to this dish. It really hit the high notes with class. The wilted lettuce held its crunch, though I didn’t feel the charred cherry tomatoes added to the dish. It didn’t subtract from it either. My dining companion across the table ordered the prosciutto wrapped scallops, with roasted asparagus & shallots and topped with a grain mustard “roe”. The scallops were large, impressively so, and were a sight to behold, presented proudly on the plate. Three fleshy, juicy marine molluscs, gift wrapped in a salty and sometimes crunchy wrapping, a stark contrast to the tender, springy interior hidden beneath the surface, waiting to be revealed by an eager knife and fork. The generous wrapping of prosciutto at times overpowered the scallop, which was a statement in its own right. The asparagus was ever so slightly underdone, firmly sealing in the flavour and adding the perfect accompaniment of crunch to the meal. The grainy mustard provided texture and zing to the dish, but let’s not overstate it, it was grainy mustard. The stand out of this dish were the scallops themselves. A delicious ocean medley of sweet, succulent meat. The shells that bore them should be proud. The pastry and baked goods are a real highlight here. Extra points for house made bread. We loved the olive sourdough and the rosemary rolls. These served with unsalted butter & two types of salt – an ebony and ivory selection – white Maldon flakes & Hawaiian black lava – impressed my dining companion to no end. 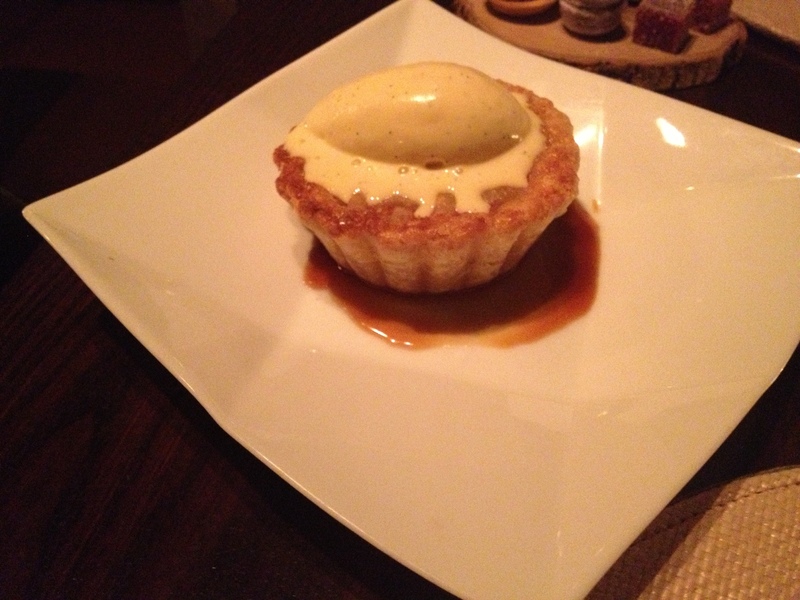 To finish, we shared a rhubarb tart with caramel sauce and Tahitian vanilla ice cream. I’ll usually opt out of dessert, but I’m so glad I didn’t. This one was mind blowing. The perfect balance of tart & sweet with salty caramel sauce, of which there was never going to be enough. I could drink this liquid gold on its own. We washed the perfect pastry down with a glass of La Spinetta Moscato. Petit Fours followed and it was clear special, painstaking attention was paid to the creation of these tiny nibbles of indulgence, perfectly formed. Those familiar with the Australian Arnotts Mint Slice would appreciate a tiny chocolate tart version of it, complete with what I think were teeny malt balls adorning the top. A mini lavender macaron, the diameter of which would not have been any larger than a 10 cent piece was the next sampling. 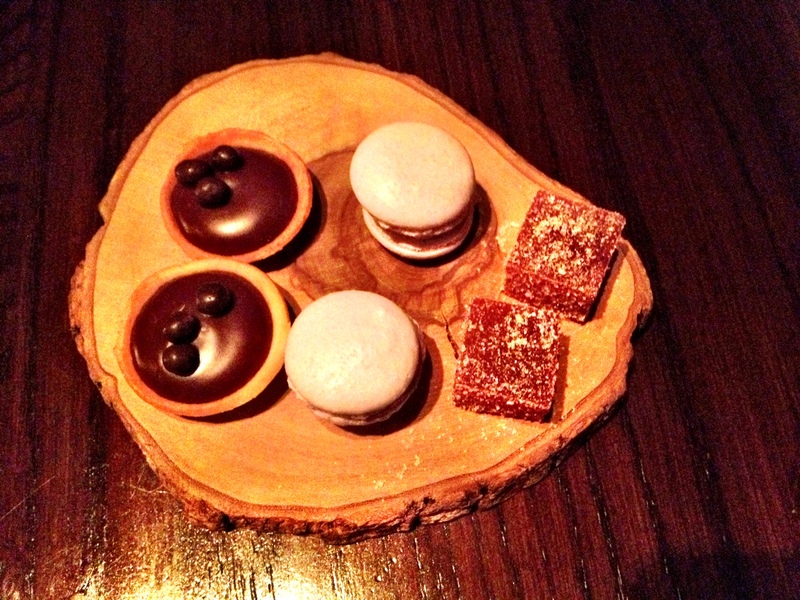 Filled with a lovely lavender butter cream, like a pot pouri, the macaron was perfectly crisp and chewy. How all that flavour fit in this dollhouse sized treat, is beyond my comprehension. Lastly, a sugar coated rose & currant jelly. Tangy & sweet. As we were closing out our check, we were handed two cellophane bags with lemon poppyseed muffins and a suggestion “for breakfast tomorrow”. A simple, elegant touch which made me adore this place even more. I needn’t tell you that these were absolutely the best muffins I’ve ever eaten. I need that recipe. This was a flawless dining experience. In Roman mythology, Veritas, meaning truth, was the goddess of truth. The phrase In vino veritas means “in wine there is truth”. Veritas’ world-renown wine cellar includes an unprecedented selection of Bordeaux, Burgundy and Châteauneuf-du-Pape. The wine cellar at Veritas is world renowned. Wine Director Alexandria Cubbage, Sommelier Dana Gaiser and Sommelier Tristan Prat-Vincent oversee the 75,000-bottle inventory and a list with over 3,000 selections. Yum I could smash some scallops for breakfast!! !